Let me say right at the start, I'm not going in to bat for the noxious, invasive weed, African Boxthorn (Lycium ferocissimum). Anyone who's had the misfortune to get caught by their long sharp spines, wouldn't quickly want to repeat the performance. It's fairly widespread around the South here, mostly on the more marginal, coastal soils. I believe it was originally imported into Tasmania in the mid 1800s primarily as a hedging plant. I suspect that it was used in place of fences, something it would have excelled at. I spent a while at Sorell recently, mainly at the Waterview Sanctua ry and adjoining areas. Around here there are still significant areas of the boxthorn, although largely cleared from the reserve. At present the boxthorn is in flower, but also has ripening fruit, as the shot at top shows. I noted there was a continuous flow of honeyeaters through the area, mainly Crescent and New Holland, but a few Eastern Spinebills, attracted to the flowers on the boxthorns. Additionally, small groups of Superb Fairy-wrens, used them as cover as they foraged across the area. I doubt that many of the honeyeaters would be present if it wasn't for the boxthorn. Additionally, they provide ready cover from predators. Probably the major users of boxthorns here are those other imports, House Sparrows and Blackbirds, the latter probably the main culprit in disseminating the seeds. Both certainly use them for nesting in. I recall, that about 30 years or so ago, in the Winter months, the Little Grassbirds could regularly be found in the long hedge of boxthorns by the chicken factory fence, alas, no more. I've noted elsewhere, that the House Sparrows use them for what I call their 'castles'. Close to where I live in Bellerive the main predator of the House Sparrow is the Grey Butcherbird. If the sparrows are being harried by them, they take cover in these very effective refuges. So while I'm certainly not advocating keeping or planting boxthorns, there can at times be an upside to them! I should hasten to add that I don't include their use as 'castles' for the sparrows as an upside. I set off early this morning, really undecided quite where to go birding. With a stiff breeze, but otherwise fine, I finally opted for a short trip to the Sorell area. After a brief stop at the Orielton Creek bridge, noting a solitary Great and 2 Little Egrets, I moved on to the lake at the Copping Golf course (on the Lewisham road). As usual I scanned the lake from my car, recording a number of Blue-winged Shovellers, several Musk Duck, a few Mountain Duck and about a dozen Chestnut Teal. I moved further down the car p ark and as I did I flushed a heron from a nearby pond. The heron, a size bigger than the common White-faced Heron, alighted about 30 metres away. A Pacific Heron. Now I expect many Mainland birders won't find that particularly exciting, but I haven't seen one in Tasmania since 1975 an d it's not for want of looking! Here in Tasmania they're rare and most often the sightings coincide with irruptions from the Mainland. So for me very exciting. As you may see from the accompanying images, this heron, which I've always referred to by it's alternate name, White-necked Heron, was fairly easy to approach. In fact after its initial flight, it walked back to the small pond close to the car park. So here are 3 of many shots that I took. For me a long overdue sighting of any sort of rarity and from previous experience, may herald other sightings of this species around the state. Little Egret are usually described as uncommon in Tasmania, but at least during the colder months you may usually find a few about some of the local coastal areas and nearby lagoons. Apart from a group of 5 at Marion Bay d uring March, I've only seen single birds. This week I've recorded singles at Sorell and Lauderdale, where I shot the accompanying images. The group of shots here were shot as the egret fished. Having stood in the one spot for nearly an hour, it suddenly seemed 'possessed' as it half ran, half flew in all directions chasing its prey, which proved to be small fish. Quite a performance. My only regret was that this all took place at extreme camera range. The pictures give just a taste of the action, before it made a final, successful stab at the prey as seen in the lower right image. Crossing the Sorell Causeway a few days ago, I noticed a number of birds fishing on either side. There was a fair bit of traffic about, and it's not the road to take your eyes off (or stop), but I did note that some of them were Great-crested Grebes and fishing fairly close in to the causeway. So I drove to the Midway Point end and walked back along the Orielton Lagoon side, hoping for a chance to photograph a species that has eluded me so far. In part that's not true, as in the halcyon days when there was water in Lake Dulverton, at Oatlands, I photographed them on a number of occasions, albeit on slide film. By the time I had walked back to where I'd seen them, they were no longer close in, so the shot at right isn't quite what I'd hoped for. There were about a dozen fishing, mainly in the lagoon, along with a similar number of Musk Duck, and a few Little Pied Cormorant. I also noted 2 Royal Spoonbill on nearby Suzie Island, now almost permanent residents. 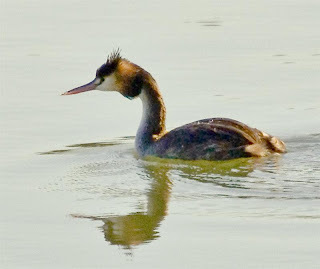 The Great-crested Grebe, often now known just as Crested Grebe, is an uncommon species in Tasmania. 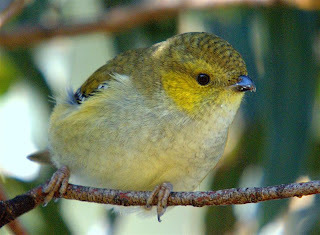 They are to be seen at times at Orielton/Sorell area, occasionally numbering as high as 70 or so, the Derwent River at Granton, and on the Tamar River in the North. They've also been recorded on Moulting and Rostrevor Lagoons on the East coast. They regularly bred on Lake Dulverton, and in the 70s I can remember seeing 6 or 7 occupied nests, usually between December and February. As far as I know, this was the sole breeding site in the state, so we have lost this bird as a breeding species, at least until, or if, we get significant changes in the weather patterns, and see Lake Dulverton filled once more. I spent a very still, sunny morning in the Peter Murrell Reserve earlier this week. I usually opt for just such a morning to visit here, as those conditions make it so much easier to pick up the Forty-spotted Pardalotes in particular, but of course, many others species too. I feel rather cheated if I haven't at least picked out a few 40 spots, wistfully hoping that a photo opportunity might even present itself. It usually doesn't! As usual I walked round the top of the upper dam (at the carpark), before setting off down the main South heading track. At this stage I noticed a fellow walker, with dog, following me, having walked past the notice quite clearl y indicating "no dogs". Which reminds me that I also had a run in with another dog owner here recently, this time with a dog quite legally off lead. However, the 'substantial' sized dog attempted to jump up at me, something that I objected to. The owner told me that this was a dog exercise area, and if I didn't like dogs I shouldn't be there! Please note, this is a conservation area first and foremost, set aside for it's natural heritage. I'm glad I got that off my chest! From the dam, I could see flocks of Black-headed Honeyeaters and a solitary Yellow Wattlebird feeding overhead. Three Tas. Native Hens swam past, (displaced by the dog)--they're actually quite accomplished swimmers, and in this reserve they get plenty of practice. A group of Superb Fairy-wr ens, feeding among the Bulrushes, stayed long enough for a photograph. On the second dam there were 2 Hoary-headed Grebes, a solitary Australasian Grebe and a pair of Black Swans. A lone Brown Falcon flew past above the trees. In quick succession, I recorded a male Golden Whistler, Grey Shrike-thrush, numerous New Holland, Crescent and Yellow-throated Honeyeaters, Eastern Spinebills, Brown Thornbills and Silvereyes. They were all putting up a racket at an unidentified 'being', which turned out to be a Kookaburra. Turning down the track at the gate, I could hear numbers of Spotted Pardalotea high above in the canopy, but still no 40 spots. Near the creek, I found Dusky, Flame and Scarlet Robins hawking from the fence. I can't recall seeing all 3 together before. Along the creek line there are numerous, mature eucalyptus viminalis, the White Gum, much favoured by the 40 spots. It was here that I finally tracked them down, in loose association with the Spotted Pardalotes. The Spotteds are usually quite easy to find as their contact call is almost incessant. Scanning them , I realised that there were several Foryspots feeding with them in the canopy. If you listen carefully you can often hear the 40 spots calling with their much quieter and less often given, monotone double note call. Here, their calls were overwhelmed by their cousins. The next hour was occupied watching them and the accompanying images were taken as a few ventured lower down. In the bottom shot, you may be able to see, what I'm reasonably sure are, bits of lerps adhering to the bill, (you may need to click to enlarge), one of their favoured foods. (Lerps are the protective covers of psyllids which excrete honeydew from leaves, and are found on the underside of leaves). The shots aren't great, but I rarely get the chance to take any. As far as I could tell, most of the 40 spots were paired, at least that's the impression I had. Walking back parallel to the creek, I found more 40 spots also in loose association with Spotteds, in all probably totaling around 30 birds. So if you're looking for 40 Spots, I suggest the mature White Gums along the creek below the second dam is a good place to start. 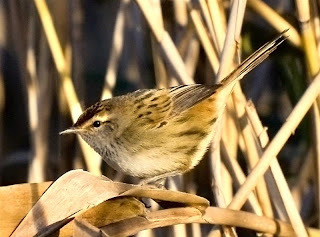 Gould's Lagoon and the nearby marshes hold a good number of Little Grassbirds. During Spring and Summer their thin plaintive tee tee tee call can often be heard. But apart from an occasional, usually brief, view of them as the fly low from reed mass to reed mass, you seldom get much of a sight of them. But this morning I finally managed to get a reasonable shot of one. With still, sunny conditions prevailing I thought that Gould's Lagoon might be worth another visit. A sighting of a Swamp Harrier quartering the Derwent Marshes as I approached the lagoon seemed to be a good omen. The reality was rather more mundane, with few waterfowl present. These were mainly Coot, a few pairs of Blue-winged Shoveler and the odd Black Duck. I think the high water level may have contributed to the low numbers, as even the Purple Swamphen were feeding on nearby grassed areas as well as the front gardens of nearby houses, as were a few Tasmanian Native-hen. I had hoped there might still be Clamorous Reed-warbler present, as I have a feeling that, contrary to the generally held view, they don't all migrate. I thought I heard their short contact calls, but couldn't be sure. Disappointed with the lack of waterfowl or obviously present Reed-warblers, I resorted to photographing a pair of Superb Fairy-wrens that were actively feeding among the reeds near the bird hide. It was while taking some shots, that I noticed a third, similar sized bird among the reeds and close to the wrens. By sheer luck I used the camera, rather than my binoculars to identify it. It briefly appeared on the outside of the reeds, just long enough to take the shot shown above. In a few seconds it was back in among the reeds, although I did notice it fly to another clump of reeds some time later. Little Grassbirds do seem to have a more restricted distribution in the South East of Tasmania these days, probably as a result of recent dry years. I can recall seeing them at Sorell around the Waterview Reserve, both on the island and among the South African Boxthorns, as well as Rushy Lagoon, but are now almost certainly absent from both venues. There are still good numbers along the Derwent shore around Granton, and at Lake Meadowbank, to name a few spots. Anyone contemplating looking for this secretive bird would be well advised to learn the call first, and perhaps wait until Spring when they become much more vocal, but perhaps, like me, you could just be lucky. A while ago now, I received an e-mail from a reader, who as it turned out, lives close by. She was enquiring whether there were two species of Turtle Doves in Tasmania, as she had a plain coloured bird as well as the 'ring necked turtle doves' in her garden. She had looked for references but couldn't find any information about the local species. 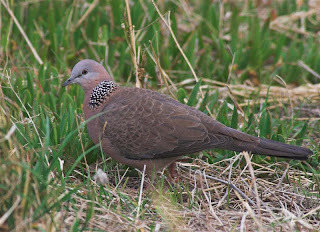 I was able to tell her that we had only the one, the Spotted Turtle Dove, and by chance I found a 'spotless' dove in the garden the following day (first one I've ever photographed) and sent here a copy of the shot. She confirmed this was the same as her bird. The bird is a young Spotted, as you can see in the shot at top right. She also went on to mention that they were locally prolific. As in other parts of Australia, the Spotted Turtle Dove is an introduced species. Locally they do seem to have increased fairly dramatically of late. I have put this down to what I call the "de-greening" of much of this suburb. Most of the blocks are the 'standard' quarter acre, that are now being infilled with multiple dwellings on each block. The upshot of that is that there has been much thinning and removal of mature trees, often replaced by concrete or lawn. 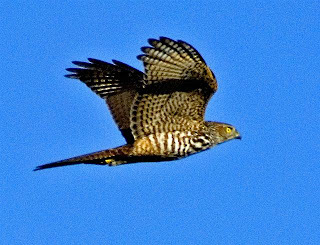 In the past, mainly during the Winter, we had goshawks and sparrowhawks, and even the occasional Australian Hobby, using the nearby trees as a launch pad for attacks on birds. On several occasions, I have seen Brown Goshawks chasing Turtle Doves. Coupled with their ability to breed almost year round, and that they are often fed by householders (I have to admit to doing so myself), and it's little wonder that they're doing so well. They do gather together at times, either to roost or to feed, although they rarely fly around in flocks. Locally I've seen as many as 30 feeding under mostly introduced trees, such as oaks. The oaks are in drives, so I presume they were eating crushed acorns. They do seem to be slowly increasing their distribution to outer Hobart suburbs, and to nearby towns. As there doesn't appear to be any native species in Tasmania that they're likely to be in competition with, they're unlikely to pose a threat. It hasn't exactly been ideal birding weather lately. Firstly several days of stillness and drizzle, followed by gale force winds and showers. Well the birds have to endure whatever comes along and sometimes that produces photographic possibilities. In windy conditions I often resort to going out to nearby headlands and trying for in-flight shots of gulls and other sea birds, and yesterday I put in a stint on Bellerive Bluff, overlooking the Derwent River. It proved rather a frustrating time. True, I did see many passing birds, Pacific, Kelp and Silver Gulls aplenty, Black-faced and Little Pied Cormorants, a few Crested Terns, and even a solitary Gannet, but as for photography, just frustration! They were either too far away, too fast, occasionally even too close and I managed few images. In my frustration I decided to scramble up the bank onto the old Bellerive Fort, built to keep the Russians out, but now largely used by the locals to "exercise" their dogs. It did enable me to get a better all round view, but didn 't improve my photographic opportunities. One of those days when "over there" always looks a better proposition. 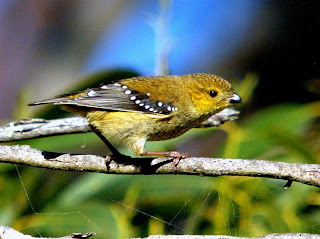 As I pondered whether to cut my loses and go, I heard the faint calls of a Spotted Pardalote barely audible above the sound of the wind through the She Oaks. The pardalotes seem to be here year round, and I suspect that they nest in the outer wall of the Fort. All thought of sea birds passed as I tried my hand at photographing this pair. 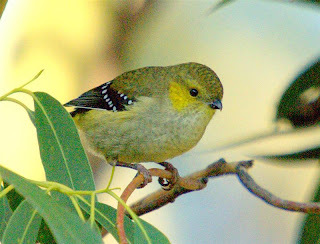 The Spotted Pardalotes, one of the smallest Tasmanian birds, are common enough, but do seem to spend most of their time in the canopy of eucalypts, giving little opportunity to photograph them. Here, aided by the fact that I'm standing on a bank, almost looking into the tops of the fairly stunted trees, I took the accompanying shots. The upper image is a female, the lower, male. I guess that, in photography, as in life, you just have to take your opportunities as they arise. I have just received an e-mail from Eric Woehler, Chair of Birds Tasmania, outlining the following sad news. Denis and Barbara Abbott were involved in an horrific road accident a few days ago, resulting in the death of Barbara, and critically injuring Denis. Denis is presently in hospital in a serious but stable condition. Denis is a long time and stalwart member of Birds Tasmania, and some may recall a few articles on this blog, where I have accompanied Denis on outings. I'm sure all will wish him a speedy recovery and offer their condolences both to him and their two sons, James and Farley.